After a year of detecting the meaning behind each type of cry, laugh, and sound, parents are anxiously awaiting their child’s first word. Typically the first word emerges around their first birthday or a few months after. Between 12-18 months, children are considered first word users for communication. (Pepper & Weitzman, pg. 8). The stages leading up to your child’s first word is particularly important, in a previous post we discussed the typical speech development timeframe. We will discuss the comprehension and expressive qualities of a first word user. Your child’s first words will most likely be objects, people or actions that are familiar to your child’s routine. The first word may be an imitation of a word they hear you say or produced completely on their own. Name all objects, people, and actions exposed to your child throughout the day to encourage talking. In order to be considered a true word, it should have a clear intention, be recognizable, and be used more than once. First words do not need to be the exact pronunciation of the word. Before the age of 3 years old, speech therapists are less concerned about speech pronunciation compared to language development. Nana for banana and paci for pacifier are acceptable first words if your child is referencing the correct item. As your child uses the words more frequently, you will start to recognize what your child is communicating. Children will also over-generalize words and use the same word for multiple objects or people. For example, a kitty may be used for all 4-legged animals, and a ball may be used for anything round. One word may be also be used to express a whole message, for instance, “juice” may be expressed for “I am thirsty”, “I see juice”, or “is it time for lunch?” By attending to your child’s action, tone of voice, gestures, and facial expressions, you will be able to decipher between each meaning. 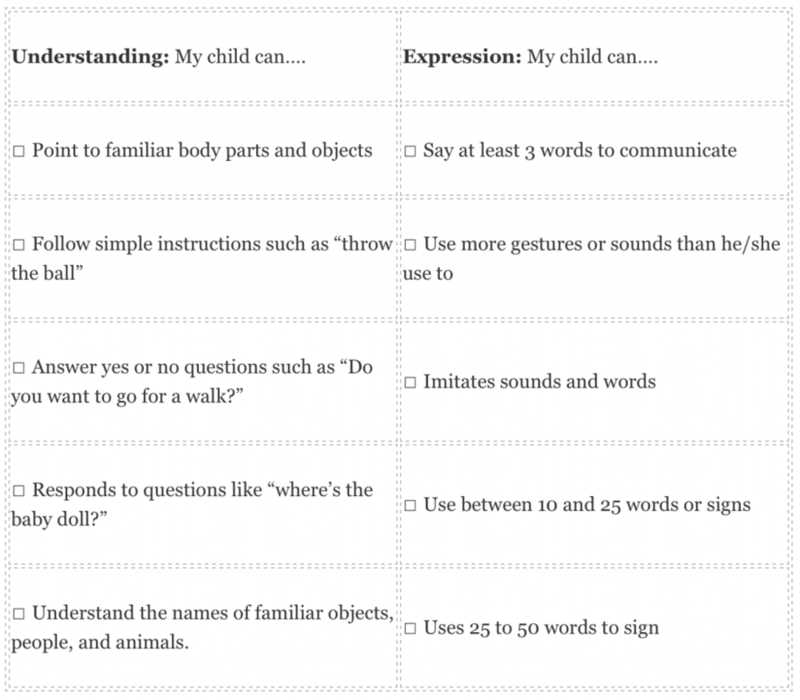 A child’s receptive language (understanding of words) is always greater than expressive language (spoken words). During the first word stage, your child increases the amount of words they comprehend. Your child will be able to point to familiar objects if you state, “Point to the flower”. Your child will also start to understand 2-3 word phrases such as “time to go”, “bath time”, and “get your cup”. Continue to model 2-3 word phrases while speaking to your child. If you can check at least 3 boxes in the understanding section and the first box of the expression, your child is considered a first word user. As your child progresses in the first word phase, they will be able to check all boxes before they start combining two-words. Next week on the blog, we will provide tips and strategies to encourage your child’s first words. If you feel your child is delayed in language, contact Lumiere Children’s therapy for a consultation with a speech therapist. Pepper, J., & Weitzman, E. (2004). It takes two to talk: a practical guide for parents of children with language delays. Toronto, Ont. : Hanen Program.